The White House announced Tuesday that President Obama has commuted whistleblower Chelsea Manning’s 35-year prison sentence, allowing her to be released from Fort Leavenworth on May 17, 2017. Manning’s sentence, wrote the New York Times, was “the longest ever handed down in a case involving a leak of United States government information for the purpose of having the information reported to the public.” The transgender Army private, formerly known as Bradley Manning, gave thousands of government files, including files classified “Secret,” to WikiLeaks. The leaked files included revelations embarrassing to the U.S. government, such as video of an American helicopter attack on civilians and journalists in Baghdad. She has twice attempted suicide during seven years of imprisonment under conditions a UN special rapporteur on torture called cruel and inhuman treatment. The military has denied Manning’s request for gender reassignment despite multiple diagnoses of gender dysphoria. The President also pardoned General James Cartwright, who pleaded guilty to lying to the FBI about his contacts with journalists about a top secret program that sought to damage Iran’s nuclear research. The support of political elites for the general’s pardon contrasts sharply with their criticism of the private’s commutation. “Current and former leaders of the American national security community have, almost with one voice, stood up for General Cartwright.” said his attorney. The Guardian’s Ed Pilkington observes, “President Obama was the architect of Manning’s undoing; now he is her savior. He holds the record as the president who oversaw the prosecution of more leakers under the Espionage Act than all previous presidents combined; now he has spun on a dime, courting conservative and military outrage by setting her free. 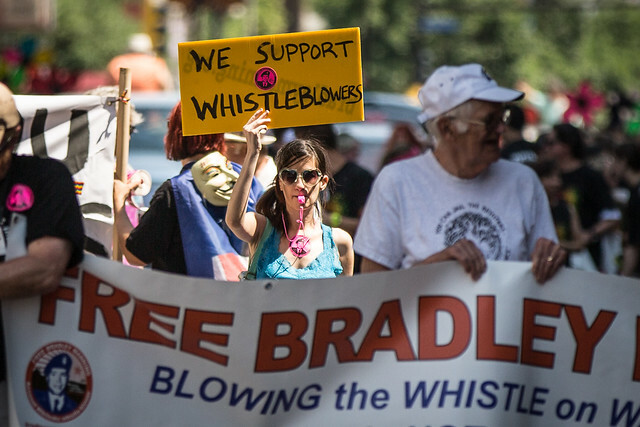 Photo credit: “We Support Whistleblowers / Free Bradley Manning / Twin Cities Pride Parade (2013)” by Tony Webster, Flickr Creative Commons.